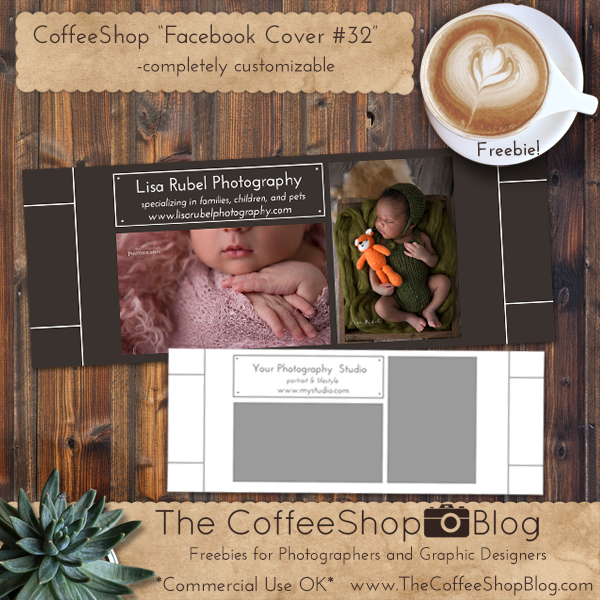 The CoffeeShop Blog: CoffeeShop "Facebook Cover #32"! Today I have a brand new Facebook cover to share with you. This one should look nice on computers and phones. It is completely adjustable and you can change the colors and/or remove the bars and even add a pretty digital paper on the background. It is a layered Photoshop/PSE file so you can add your images using clipping masks (tutorial and free action). I wanted to thank Lisa Rubel Photography for allowing me to use her images in my example above. Download the CoffeeShop "Facebook Cover #32".